Car Trouble Starting In The Cold? Winter can be a difficult season to get through. Especially because of those cold, dark mornings where it’s too painful to slip out from under your duvet, that hesitant peek you take out of your window to ensure it hasn’t snowed and do not even get us started on car-related issues! 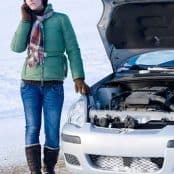 Unfortunately, various car troubles tend to crop up when the temperature starts to drop and unlike us humans, our vehicle’s cannot layer up during winter. Essentially, cold and damp weather may cause issues for many of your vehicle’s components, such as your batteries, the fuel system, oil and starter motors. Here are the most common car problems during the cold and wet season. Once winter really kicks in and the temperatures drop below zero degrees, it can be difficult starting your engine, as the battery cannot generate as much electrical current as it does on a hot day. If your car battery is more than 3 years old, you should consider replacing it before winter hits full force or at least test it, to avoid any other car problems that may be caused by a dead battery. Also, by doing this, you can try and prevent any breakdowns that may occur if you continue driving with a battery that needs replacing. On those freezing mornings, your car’s fluids, such as the engine oil, will more than likely have thickened in consistency. Consequently, the oil will not flow as easily, thus the engine components will find it harder to move through it and in turn, your battery will become overworked in trying to get the engine to start. To avoid this problem, allow your engine to warm up for at least 10 minutes before heading out. This may seem frustrating in the morning, especially if you’re running late, however, you should try your best to let your car warm up, just like we are taught to warm up before a workout to avoid injuring ourselves. Just like replacing your batteries before the onset of winter, consider changing your vehicle’s fluids as well and also ensure that they are at the recommended levels. Wiper failure is also a common problem during winter time. This is usually due to turning the wipers on without clearing the windshield. Due to this action, the wiper motor is put under stress when struggling to clear the snow off the windshield and can fail prematurely, which can be an expensive repair. Therefore, to avoid this occurring, it is best to clear the snow/frost from your screen before using the wipers. Tyre pressure will also fluctuate when the temperatures decrease. Therefore, regularly check your tyre’s pressure indicator on your dashboard before heading out. Therefore, it’s highly recommended that before the winter season sets in you should schedule your vehicle for a checkup. Get in touch today to see how Sinspeed can help, with a free Winter Health Check! Tags : auto troubles on winter, car trouble starting, car troubles during winter, starting issues, winter time car issues.